Today is a day that many profess their love for that special someone. While many people consider giving chocolates, candy, flowers, or even a stuffed bear this Valentine’s Day, have you ever considered giving a tree? This would be a lifelong gift instead of a temporary one that is here today and gone tomorrow. The Arbor Day Foundation suggests giving a tree for special occasions such as weddings, birthdays, and celebrations of milestones. Why not profess your love this Valentine’s Day with a tree that will grow through the years of a marriage? Perhaps a beautiful flowering shrub or bush will better meet your needs for showing your affections. After all, this tree or bush will be visible 365 days a year for you and your loved one to enjoy through the various Georgia seasons. According to the Old Farmer’s Almanac, there is more than meets the eye with flowering trees and bushes. Perhaps a deeper meaning in that tree or bush will best capture the message that you intend. We offer a wide variety of trees and shrubs that can help capture those deeper meanings. 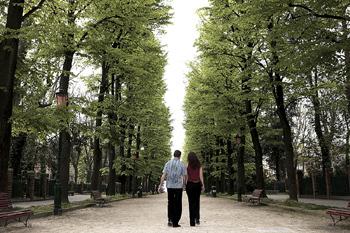 Are you looking to plant a tree for the legacy that is to grow out of a relationship? Consider the “Legacy” Sugar Maple. At Hutcheson Horticultural Company we celebrate the outdoors everyday with our beautiful landscapes and hardscapes in the greater Metro Atlanta area. We are landscaping experts that can strategically design and install a beautiful landscape that integrates the tokens of your love. Contact us today so that we can help meet your landscaping needs.